The possible imposition of visas on Hungary to cut off an influx of asylum seekers was serious enough to be included in a briefing note to Immigration Minister Jason Kenney in advance of a meeting with the UN high commissioner for refugees, newly released documents show. And while the measure was never introduced, the documents have once again highlighted the sensitivities surrounding visa requirements and the anticipation with which some countries are waiting for the government’s new “safe-country” list. High Commissioner António Guterres met Immigration Minister Jason Kenney during a March 23 to 25, 2010 visit to Ottawa. Media reports had earlier flagged a skyrocketing number of Hungarian refugee claims since the Canadian government lifted previous visa requirements on the country in the spring of 2008. At that time there had been between 20 and 40 a month, but with the visas removed, the number had risen to about 200 by the Fall of 2009. At the time, there were widespread reports the government would reimpose visa requirements on Hungary as it had with Mexico and the Czech Republic. Amid this climate, Mr. Guterres met Mr. Kenney. Documents Embassy obtained through an access to information request indicate departmental officials briefed Mr. Kenney on what to say only if Mr. Guterres asked about Canada’s visa policy. Sean Rehaag, assistant professor at York University’s Osgoode Hall Law School said the Canadian government may have been worried the UN high commissioner would ask about Canada’s visa policy. He said the refugee advocate is always concerned whenever a government imposes a measure that prevents people from reaching their borders to file refugee claims. The Immigration department dismissed the visa policy red-flags as run-of-the-mill. “It’s common practice to brief the minister on a variety of refugee issues prior to meetings,” said spokesperson Nancy Caron in an email to Embassy. The UNHCR’s Canada office has been following up on the visa policy issue because it touches upon its larger interest in issues surrounding access to territory for asylum seekers fleeing persecution, said UNHCR Representative to Canada Furio De Angelis in an email to Embassy. 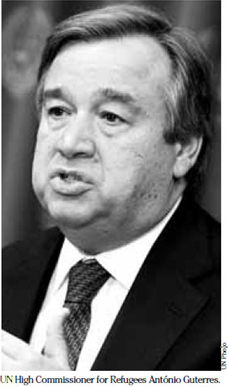 Within days of Mr. Guterres’s visit, Mr. Kenney introduced the Balanced Refugee Reform Act, which passed last June. It includes the authority to develop a list of designated countries of origin— so-called “safe-country list—identifying those nations with robust human rights records that don’t normally produce refugees, whose claimants would be fast tracked through the process and given less time to appeal a negative decision. The department said this week it’s reviewing comments on proposed regulations to accompany the new legislation, and until that’s done and the provision comes into force, slated for the end of this year, countries can’t be designated on the list. Hungarian Deputy Head of Mission Tamás Király said he is very hopeful Hungary will be on the list of “safe” countries. Mexican and Czech officials have also said they are hopeful their countries will be on it and the visa requirements cancelled. Immigration lawyer Max Berger predicted they would all be on it as Canada is reluctant to impose further visas on EU countries like Hungary, he said. If Hungary is on the list, he said, members of its Roma community, who make up the majority of refugee claimants, would not be happy. Mr. Kenney has previously denounced similar Czech claims as “bogus,” while Roma advocates say some of them have a justified fear of persecution.